Update: Two more bodies were found in the building since the fire was put out, raising the death toll to eight people, including two children, an Investigative Committee spokesperson was cited as saying by Interfax. Eight people have died in an apartment fire on Nikitsky Bulvar in central Moscow, authorities said on Monday. 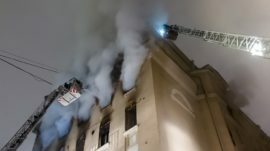 Videos published online showed firefighters dousing the flames on a fifth-floor balcony of the historic building in the dead of night. The Emergency Situations Ministry initially placed the death toll at four killed and two injured in the fire. The seven-story building is now at risk of collapse, an unnamed source told the state-run TASS news agency. Investigators opened a probe into the incident. The fire may have been caused by a short circuit in one of the apartments, a landlord was cited as saying. The building, located in central Moscow’s Arbat district, was built in 1914. A fourth-floor apartment in the building has reportedly been placed on sale for 36.9 million rubles ($562,000).